Should I start my cannabis plant with seeds or clones? Should you start growing your cannabis plant with seeds or clones? Each method has pros and cons, so check out the comparison below to find out what's right for you! If you buy your seeds from an established seed bank, than you have a great idea on how your plant will be like in terms of looks, yield, quality, and flowering time. You can purchase feminized seeds from a seed bank which means you will get 100% females and don't have to worry about male marijuana plants. Only female cannabis plants produce bud. Learn more about male and female cannabis plants. If using non-feminized seeds, about half of the plants will end up being male, which do not produce buds. Learn how to identify male plants right away. Seeds are a good way for many people to start growing because they can be easily purchased off the internet. Where can I safely purchase cannabis seeds? Sometimes you will find good seeds (bagseed) in marijuana that you have purchased which can definitely be used to start growing. The downside of using seeds that you find is you will have no idea what to expect as far as growth, yields, or size. The bud quality of bagseed is often different from the buds it came from, since it is not a stablized strain. It could be like the bud it was found it, or it could be completely different. When using unknown seeds, you will need to determine the gender your plants as they are growing to prevent any males from pollinating your females. Healthy seeds should be dark brown or light grey. If you find seeds which are small and white, they are likely immature and won't germinate properly. Healthy seeds can be stored in a cool dark place, or your fridge until you're ready to use them(don't freeze them). Seeds which are kept in a cool, dark place remain viable for years, though after a few years you will notice that they take a bit longer to germinate and you may get a few more duds than with fresh seeds. Seedlings from older seeds can also be really slow growing even if you're giving them perfect conditions. Clones usually have a head start compared to starting with a seed, since clones are usually already mature and established when you start growing with them. Compared to seeds, clones usually have an overall shorter grow period and therefore will be ready to harvest a bit more quickly. Since clones are genetically identical to their mother plant, you know almost exactly what you're getting. Although there is some variance even between clones, they tend to grow much more alike than two random plants. In order to get clones, you will need to know someone who already has marijuana plants, or you may be able to buy some from your local medical marijuana dispensary if you're in a suitable location and have a recommendation for marijuana from your doctor. Starting with a clone can save you a couple of weeks compared to starting with seeds because they have a head-start on growth. Using clones also guarantees the gender of your plant because the clones have the exact same genetics as their parent plant including gender. If you have a female plant that you like, you can just clone her indefinitely to make more plants without ever again having to worry about sexing your plants or creating seeds. Yet you will also end up with the same strain/genetics for every clone you take off the same plant. If you're starting out with a clone, you want to treat it gently for the first day or two that you have it. If your clone hasn't established roots yet, then you want to make sure that it stays moist and gets gentle light (like from florescent tubes) until it develops some roots. A humidity dome will help the plant get moisture until she's established her roots. If your clone has already established its roots, then put it in its new home with your lights a bit further away than normal until she's settled in and showing new growth. Only give your clone just a little bit of water at first with a highly diluted cannabis-friendly "grow" nutrient solution. It's tempting to want to put your lights close to the new baby and give it full-strength nutrients because you want to do everything you can to make sure it does okay. However, in the very beginning, less is more for your clone. Your clone is more sensitive to heat and light than an established plant, and you're putting it in a completely new environment. It's important to check on your clone frequently during it's first 24 hours to make sure there isn't any unforeseen problems such as it tipping over. Once the clone has started really growing (usually after a couple of days) then you can put your lights closer and start feeding it with full-strength nutrients. 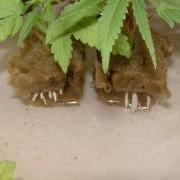 Get Started with Making and Caring for Your Clones! What strains are good for beginners? How Long Does It Take to Get to Harvest? Cost can be high to continue using seeds, whether in time or money. You can spend a lot of time cross-breeding plants and controlling the number of males to produce your own seeds. If making your own feminized seeds, you have to worry about creatingmasculinized female plants which also won't give you any bud. If you choose to purchase your seeds for every crop, than the cost can really start to add up.